The Lonestar Racing SR1 Team had a very interesting weekend, packed with highs and lows. We were welcomed into one of the nicest race tracks in the U.S., Miller Motorsports Park. This facility is 1st class, complete with asphalt pits, garages, huge covered grandstands, on site race fuel station, showering facilities, indoor race control complete with timing monitors, and the list goes on. Things were a little disorganized as this was the 1st event LOORRS has put on at this park, so it was to be expected. Once we finally got our pits set up after having to move it twice, we put in a brand new clutch into the car, because it was slipping on the last testing session. After the first practice session, we realized this was going to be a tough weekend. The track was one of the biggest we had been on, but they added a lot of obstacles to keep the speeds down, and the excitement up. With only a few short hours before the next session, Greg decided that some shock changes were in major need, so we began to make some pretty major changes to handle the very different track. With about 15 minutes to spare, we headed out for 2nd practice. The changes really helped the car perform. Greg was able to power through the rhythm section, and hammer down through the larger woop section, and get enough speed out of the corners to clear some of the doubles on the front stretch. While looking for some different lines, Greg hit a finger in the S section, and that kicked up the back of the car, and sent it into a violent cartwheel that flipped the car end over end about 4 or 5 times. Amazingly, Greg walked away without a scratch, let alone any soreness thanks to his Simpson Safety gear and Jet Trim seating that kept him locked in place. The car on the other hand, wasn’t as lucky. The front right side of the car took most of the punishment, as it destroyed a wheel, spindle, brake rotor, tie rod end, brake line, uni-ball stud, and ball joint. The front bumper, upper shock mount, and body mounts got bent, along with the back bumper. Overall, the car was in really good shape with all things considered. Luckily, between us, and Weller Racing, we had enough spares to get us back on the track for Saturday’s qualifying and Main event. Greg qualified in 2nd position for Saturday, so he was able to enjoy another start from the front of the pack. After the green flag, he quickly realized he was getting brake fluid all over his feet, from a leaking reservoir cap. Not knowing how much longer he could go, he kept pushing. In second place with only a few laps to go, Corry Weller spun out in front of him, and he almost plowed straight into her, but luckily, he was able to glance off the side of her and continue into 1st place. Unfortunately, the hit ripped off Corry’s front wheel putting her out of the race. He was able to secure 1st place for Saturday’s main! Sunday was time to do it all over again. In qualifying, Greg was only able to put in 1 lap before broken motor mount bolts caused him to pull off the track. So it was again time to start at the back of the pack for the main. Starting in last place, he was able to work himself into 4th pretty quickly, and battled with Tyler Herzog for a few laps, getting into 3rd place, and getting knocked sideways and having to fight back to get into 3rd for the competition yellow. The car was running perfect, and was fast through the rough sections where others couldn’t run as hard. Within 2 laps, he passed Doug Mittag for 2nd place, again behind Corry Weller. He was on Corry’s bumper for 2 more laps and went for the pass in the rhythm section. Unfortunately, he had just a little too much speed, and caused him to fly out of control, hit a jump sideways, bounced off a water barrier, and back onto the track loosing some ground. The car was shaking violently from the rear end, and was leaning very hard into corners, so with good communication from his spotters, he was able to keep it in 2nd place for the remainder of the race. After taking a quick look at the car after the race, it suffered from a rear wheel half full of dirt from hitting a jump sideways, and caused a rear sway bar link to break, so damage was minor, but felt a lot worse. So to conclude the weekend, after thinking our chances were slim with a broken car in the beginning, we battled through getting the car back into race form, and got on the podium with a 1st and 2nd place in just the 3rd weekend of the series. Combined with a couple cars that did not show up will drastically help move us up in the points after such a successful weekend. We for sure have to thank all of our sponsors for supplying us with flawless parts that can take the abuse of a super rough track. At the end of the race, Greg said his arms and hands were so tired, he could barely remove his gloves, he was so worn out! We are very confident we will be getting top finishes for the rest of the season, and hopefully can get up into the battle for the championship! 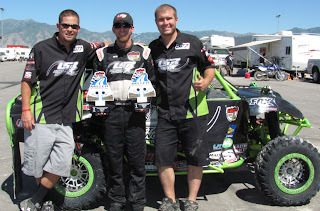 Next race is at Glen Helen, in Southern California, the weekend of August 6th. Make sure to come out and see all the action!